ექსპერიმენტული მოკლემეტრაჟიანი ვიდეო ფილმების ჩვენება. ევი შუბერტი, რეჟისორი და ფოტოგრაფი, ცხოვრობს და მოღვაწეობს ბერლინში, (გერმანია). პრეზენტაციისთვის იგი აწყობს გერმანული თანამედროვე ვიდეო პერფორმანსის და ვიდეო ნამუშევრების ჩვენებას. ვიდეო ჩვენების დროს ყურადღება გამახვილებული იქნება პერფორმანსზე, საკუთარი თავის სოციალურ და/ან პოლიტიკურ კონტექსტში. ნაჩვენები იქნება ისეთი ხელოვანების ნამუშევრები, როგორებიცაა ბიორნ მელუზი, ჰერბრეტ ფრიტჩი, შარამ ენთეკაბი და ევი შუბერტი, გაიმართება დისკუსია. 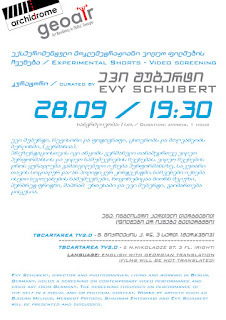 Evy Schubert, director and photographer, living and working in Berlin, Germany, holds a screening on contemporary video performance and video art from Germany. The screening focusses on performance of the self in a social and or political context. Works by artists such as Bjoern Melhus, Herbert Fritsch, Shahram Entekhabi and Evy Schubert will be presented and discussed. ევი შუბერტი დაიბადა 1981 წელს, ქალაქ ბრემენში, გერმანია, ამჟამად იგი ცხოვრობს და მოღვაწეობს ბერლინში. ფოტოგრაფიაში მან განათლება მიიღო ‘Spéos Photographic Institute’-ში პარიზი, ხოლო სარეჟისორო განათლება თეატრში ‘Volksbuehne am Rosa-Luxemburg-Platz’, ბერლინი. ამასთან ერთად იგი ფლობს აკადემიურ დიპლომს სოციალურ მეცნიერებასა და კომუნიკაციის დარგებში (ბაკალავრის ხარისხი), ერფურტის უნივერსიტეტი (University of Erfurt) და სამაგისტრო ხარისხს თეატრმცოდნეობაში, თავისუფალი უნივერსიტეტი, ბერლინი (Freie Universitaet Berlin). ევი შუბერტის ნამუშევრები არის სოციოლოგიის, პოლიტიკური და კულტურული ფენომენების სიმბიოზი რითიც იგი თავის არტისტულ ენას ქმნის რომელიც ვიდეოს, პერფორმანსების და ფოტოგრაფიის სახით გვევლინება. ამჟამად ევი შუბერტი მუშაობს სამნაწილიან ვიდეოპერფორმანსზე რომელიც დროის აღქმას ეხება. ამ ტრიპტიხის პირველ ნაწილიში “Ich warte nicht auf dich mit diesem Tag” (“ამ დღით მე შენ არ გელოდები”) ოთხი მოხუცებული ადამიანი გვაჩვენებს დროის ამაოებას მაშინ, როდესაც ისინი სიცოცხლის და სიკვდილს შორის არიან. მეორე ნაწილი ფილმისა იქნება პასუხი პირველზე და მას ევი შუბერტი საქართველოში, გეოეარის რეზიდენციაში ყოფნისას გადაიღებს. Evy Schubert, born in 1981 in Bremen, Germany, living and working in Berlin, got educated as a photographer at ‘Spéos Photographic Institute’, Paris, and as a director at the theatre ‘Volksbuehne am Rosa-Luxemburg-Platz’, Berlin. Furthermore she holds an academic degree in social sciences and communication science (BA, University of Erfurt) as well as theatre science (MA, Freie Universitaet Berlin). Her work can be understood as a symbiosis of these fields in order to discover a sociological, political and/ or cultural phenomenon leading to an artistic result varying from video performance to still photography. Currently Evy Schubert is working on a triptych of video performances that deal with the perception of time. In the first work of this circle “Ich warte nicht auf dich mit diesem Tag” (“I am not waiting for you with this day”) four elderly people demonstrate and reflect the stillness and usefulness of time and waiting at the in-between of life and death. This video performance is currently being post-produced. 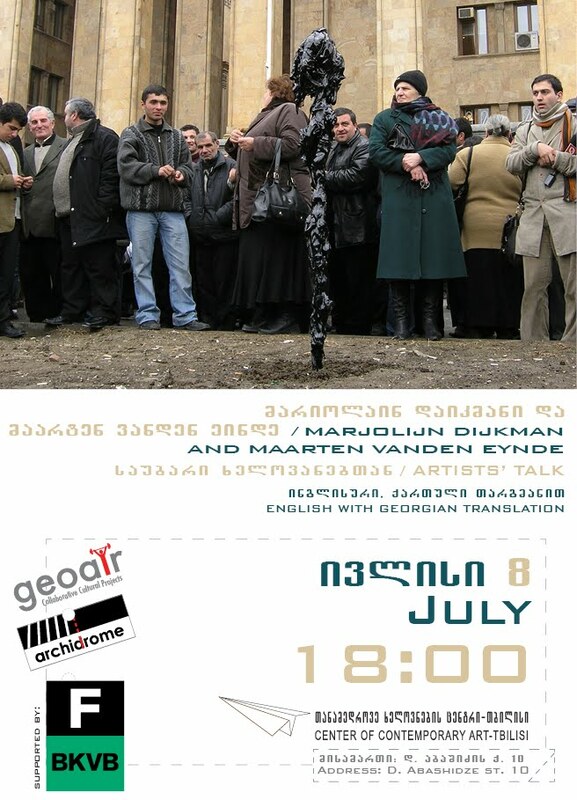 The second filmic work will be a direct answer to “Ich warte nicht auf dich mit diesem Tag” and will be realized throughout an artistic residency at GeoAIR in Tbilisi, Georgia. დილა მშვიდობისა, საქართველო! რუსთავი2 / Dila Mshvidobisa, Sakartvelo! Rustavi2.28.09.2012 /07.45 h.